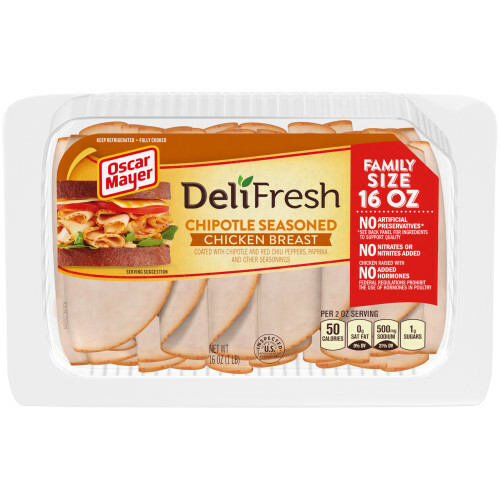 OSCAR MAYER Deli Fresh Chipotle Seasoned Chicken Breast is 98% fat free, made with quality meat and with no artificial preservatives, no added hormones and no nitrates or nitrites added. So you can enjoy the bold taste you want with nothing you don't! 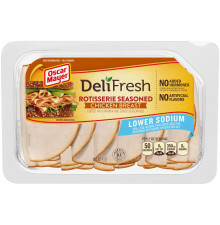 CHICKEN BREAST, WATER, CULTURED DEXTROSE*, CONTAINS LESS THAN 2% OF MODIFIED CORNSTARCH, SALT, SUGAR, VINEGAR*, CULTURED CELERY JUICE*, SODIUM PHOSPHATES, CARRAGEENAN, CHERRY POWDER, LEMON JUICE SOLIDS, SPICE (CONTAINS CHIPOTLE CHILI PEPPER), NATURAL FLAVOR. COATED WITH SEASONINGS [BLACK PEPPER, RED CHILI POWDER, ONION POWDER, GARLIC POWDER, GROUND OREGANO], SALT, TOMATO POWDER, OLEORESIN PAPRIKA, CHIPOTLE PEPPER POWDER. 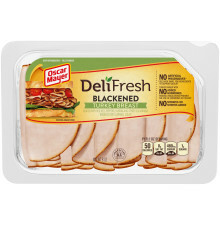 *INGREDIENT TO PRESERVE QUALITY.